Elegant and on-trend, the Leigh Suede Wedge Bootie has a refined, feminine shape and pairs beautifully with a lot of different looks. The genuine suede uppers are soft and supple, and the zip closure on the medial side makes getting them on and off easier. Inside, there’s a soft foam footbed on top of a shock-absorbing wedge and rubber outsole for a smooth ride wherever you’re going. Finally, the wedge heel gives you the lift you want without taking you out of your comfort zone. 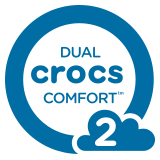 This is an essential style for the season, with Dual Crocs Comfort™ inside.